Micro grand in red designed to fit in your home. Smartly and efficiently designed, the Suzuki MDG-300 has all of the capabilities a modern digital grand piano should have, and fits all of this beauty and capacity into a compact size. Also available in high gloss black polish, this is the bolder Red MDG-300. It is perfectly portioned and will add both warmth and charm to your personal environment. Measuring only 2'-4" deep, it comfortably fits any room size. Technically speaking, the MDG-300 has enhanced performance features not found on any Digital Grand Piano in its price range. A full complement of hi-tech features allow for endless musical possibilities. Bluetooth connectivity allows you to access music, lessons and demonstrations from the Internet. A full-color LCD control screen makes it easier to organize your selected features. 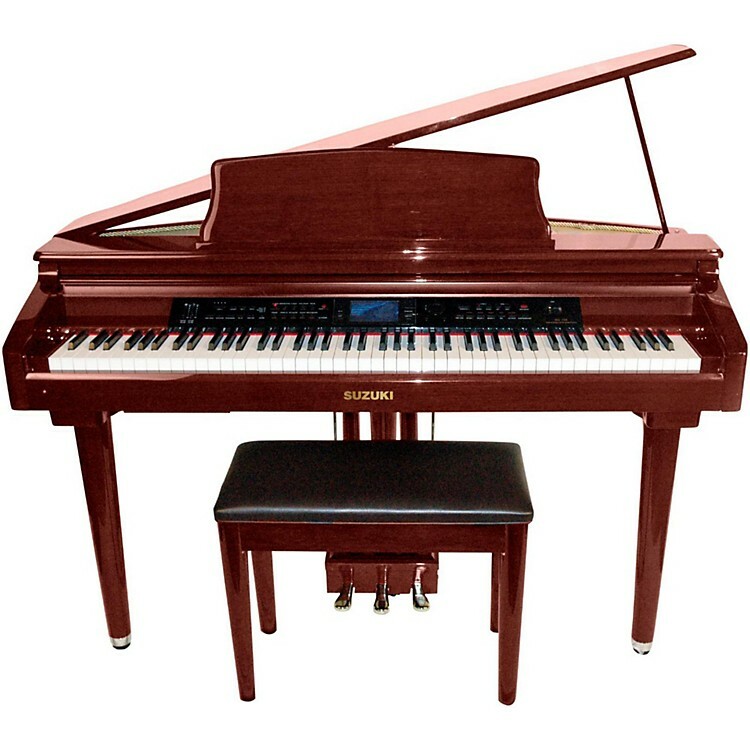 The piano voice is an amazing 24Mb of powerful sound reproduction played through a 6-way stereo sound system. Create your own original compositions with the onboard 3 track music sequencer. Save and store to the Secure Digital (SD) Memory Card. The new MDG-300 is a complete entertainment center. It blends perfectly into todays modern living space and lifestyle. Whether you are just starting out or an accomplished musician, the MDG-300 is ready to perform for you. Also available in Cobalt Blue, Brown, and Black finishes. Your home needs a piano. This may be the one. Order soon.